Faraway, so close. The Packers went into the Colosseum against the undeafeated Rams and nearly came away with a win. Except they didn’t and their record now stands at 3-3-1. It could be worse, but it could also be a lot better. But we’re not here to talk about that. We’re here to talk about how the passing offense looked. Let’s start with the bad. It’s not that I dislike this play itself, but I don’t love when this specific play was used. The Packers defense played extremely well in the first half, but the Rams were able to creep back into the game before halftime. The Packers defense held the Rams offense without points in the first drive of the second half, and the Packers now found themselves in field goal range. A touchdown here would have been huge. However, the Rams pass rush was starting to generate pressure, so the ball needed to come out quickly. On the left side, we have a stacked look off the end of the line with Jimmy Graham  and Randall Cobb . We saw a lot of this look before Cobb was injured, so I was excited to see it fired back up with the two of them this week. Out of this stacked look, the Packers have liked running the Texas concept (or, at least, variations of the Texas concept). Let’s talk about Texas for a minute. 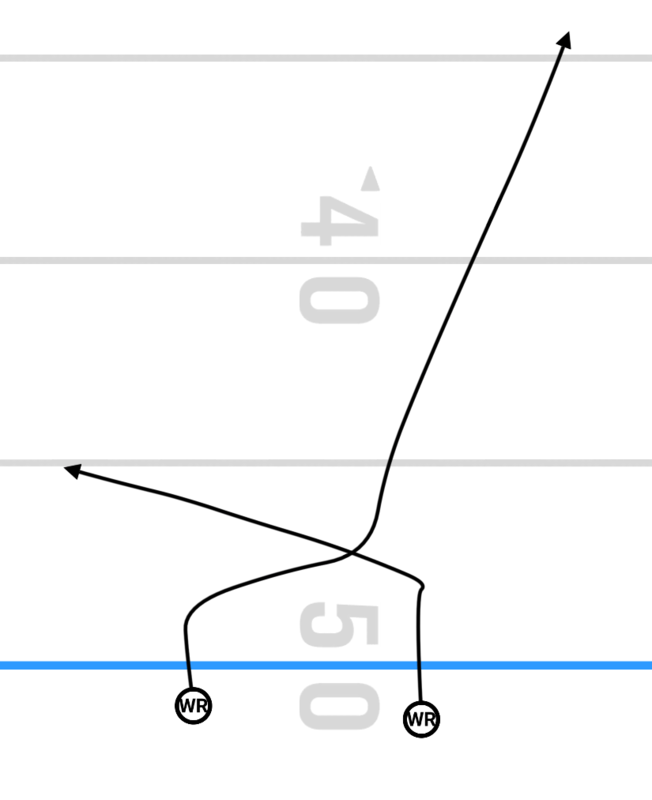 It’s essentially a clear-out route off the end of the line with an angle route underneath. It was made famous by Mike Holmgren, who used it to create holes in Cover 2 and exploit those holes. When the linebacker falls underneath the post, the angle route is wide open. It’s the same idea but out of a stacked look. It has generally been run with Graham as the front receiver in the stack and Cobb behind him. They’ve run variations off of this, but this is the main idea we’re looking at. Since they’ve run it more than a couple times, that means defenses are likely preparing for it. For what it’s worth, I actually like this look better than the standard Texas look. It allows Graham to work as a kind of shield when pushing off the line. On this play, they line up in the stack, but Graham doesn’t push up the field. He drifts outside, taking a couple defenders along with him. Cobb delays and cuts into the middle. They set up their tendency with this look and ran a variation with the TE portion, hoping to open a lane in the middle. This is all fine and good. Like I said, I love seeing how the Packers have been using the Graham/Cobb stack. The problem here is that, for a short, quick-hitting type play, it takes entirely too long to develop. This appears to be Aaron Rodgers’ first read, but pressure is in on him by the time Cobb is breaking. 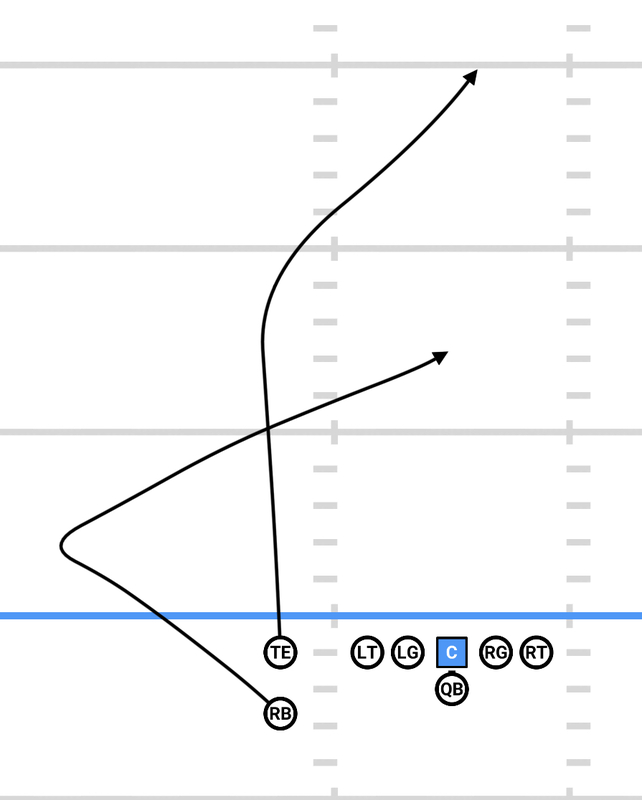 I don’t hate the route concept, but I don’t like that a quick-hitter takes this long to develop. Let’s talk about the mesh concept. I talked about this back in Week 5 when the Packers ran an offset drag, but let’s roll through the idea again. You’ve got a couple crossers – I usually refer to them as “dueling digs” – and a receiver running a crosser behind. The idea is that the digs will act as a natural rub in man coverage or work to spread the linebackers wide in zone. Either one of those will either spring one of the digs or open up a free spot in the middle of the field for the crossing route. The Packers have run this a ton of times over the years, so defenses look for it. But there are variations. Oh, there are variations. On this play, the outside receivers look like they’re going to cross, then promptly reverse back to the sideline on a pivot route. Since this is man coverage, you get the defenders thinking about what they need to do to carry their receiver across the formation. Instead of doing that, the receiver cuts back and suddenly the defender is out of position. Back to the gif. Look at how this works on the right side, with Sam Shields  trying to pick up Geronimo Allison . Due to Allison crossing under the release from Jimmy Graham , Shields has to hesitate a beat. When he can finally attack, it’s from an outside angle. When Allison reverses his route, Shields is out of position. Not for long, but for long enough. Edge pressure gets to Rodgers before he can release it, but if this ball is able to come out as Allison is making his break, it’s a first down. We’ve got a couple checkdown options in the flat, but this is essentially a two-man route, attacking the single-high safety. Equanimeous St. Brown  is running a deep crossing route from the right, while Davante Adams  is running a post route from the left. So we’ve got a two-on-three situation. Rodgers basically just needs to read that safety. If the safety stays on the post, Rodgers has St. Brown on the crosser. If the safety jumps the crosser, Rodgers has Adams on the post. I talk quite a bit about the depth of routes and this is what I’m referring to. If the crosser is too shallow, the safety won’t have a reason to attack it. By pushing upfield, he forces the safety to make a decision on who he is going to pick up. I love this angle because it gives a better view of the route from St. Brown. He angles in, briefly pushes up to make the defender think he may be cutting the route upfield, then cuts back to the outside. Look at the separation that second move gives him. Very nicely done. The Packers did quite a bit of this against the Rams. They’re running dual out routes on the left, one about 3 yards deeper than the other. This was a pre-snap read for Rodgers: he’s looking at the depth of the defenders and their initial movement. Geronimo Allison is on the outside and his defender is 10 yards off the line. 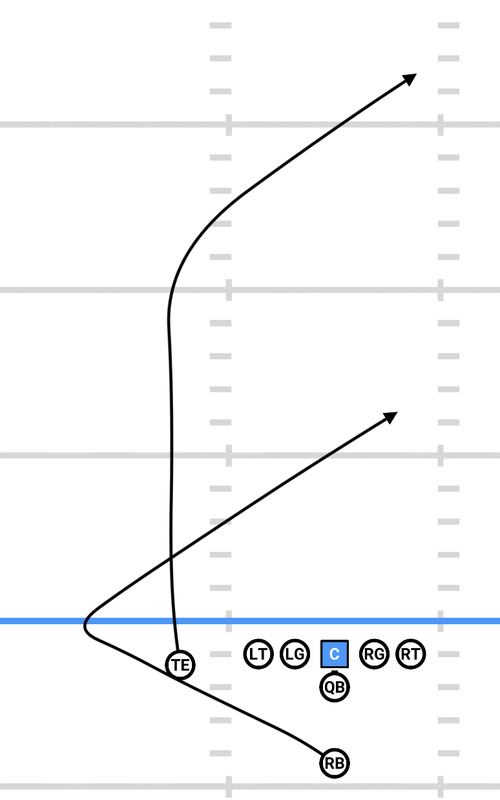 The defender is backpedaling at the snap, so Rodgers knows he won’t be able to jump the route. He hits the top of his drop and lets it fly. Allison makes a man miss and the Packers pick up an easy 14 yards. I’ll grant you that it’s not an overly interesting play to break down, but it shows something that the Packers were doing against the Rams to pick up quick yards. It also fits nicely into my next play and a larger talking point I wanted to bring up. A slant/flat combination is exactly what it sounds like. 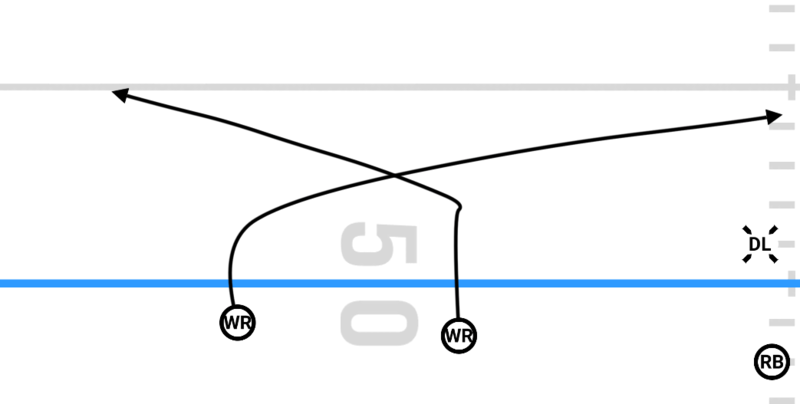 An inside receiver runs to the flat while the outside receiver runs a slant. The Packers run this a lot. And here’s your Sluggo. The outside receiver looks like he’s going to run a slant route, then breaks on a go. 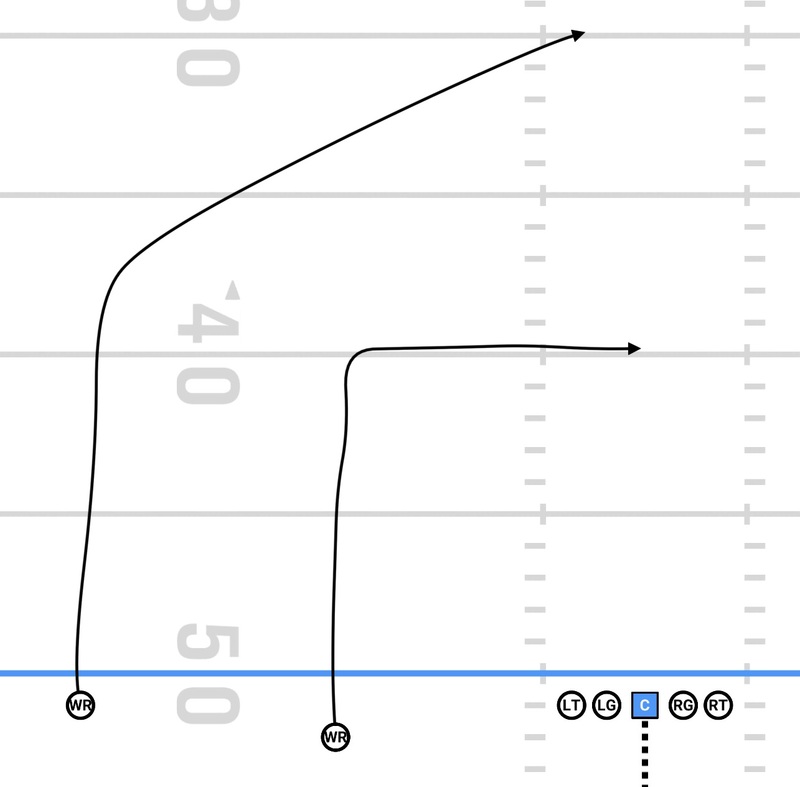 Slant-and-go, shortened to “sluggo.” The idea is that you set up you slant tendencies, get the defenders to jump that tendency then run counter to it. On this particular play, Rodgers pumps towards the slant to try to get the defender to bite. He doesn’t bite and Rodgers is forced to look elsewhere. I mentioned that the Packers run slant/flat combos a lot, and that’s because they do. But they didn’t in this game. In fact, I don’t think they ran it a single time against the Rams. This Sluggo is the closest they came. The more I thought about it, the more it seemed that the Packers weren’t really targeting the short middle of the field (“short” being anything thrown within 15 yards of the line of scrimmage). So I looked into it. On the season, the Packers have targeted the short middle area 51 times, accounting for 18.7% of their total targets. 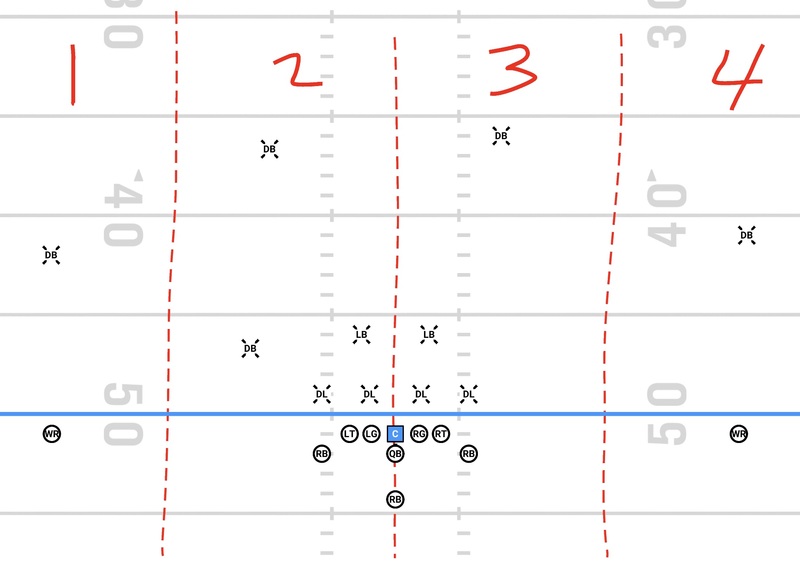 In this game, the Packers targeted that area 1 time, accounting for 3.3% of their targets. Think about the mesh variation we looked at earlier: running away from the middle of the field. I have to believe that the lack of targets in the middle was no accident. The interior of the Rams’ defensive line is very strong. I’m assuming this is something the Packers gameplanned around. In an attempt to avoid batted balls, they decided to target outside the numbers. Combine that with the Rams cornerbacks struggling and you have a lot of passes going to the outside. Since I started this thing, we’ve talked a lot about offensive schemes and ideas and not much about the defensive side. Let’s change that. Let’s talk Quarters coverage. Please turn your attention to the following, extremely professional diagram. Anytime you hear Cover 1, Cover 2, etc. you’re basically talking about the deep zones for defenders. Cover 1 means you have a single deep defender responsible for everything deep, Cover 2 means you have two deep defenders, and so on. It’s not always quite that simple, but that’s the general rule. Quarters – or Cover 4 – follows that same logic. You have 4 deep defenders, each responsible for their zone. Split the field into fourths – or quarters – and you’ve got your assignments. What we’re seeing above is slightly different. It’s pattern match, so zone turns to man coverage depending on the routes. You can see the defender on the left carry Davante Adams  up the field, even though it means him leaving his “zone”. I don’t know that we’ll get into pattern match just yet, mainly because I’m tired and it gets complicated. Apologies. Apologies all around. So, with this little explanation, take another look at the gif above. The two defenders in the middle are fairly shallow and Rodgers knows Adams is running a post over the top. So unless one of them bails at the snap, he knows he has Adams man-to-man on the post. Nothing too fancy. The dig is meant to take away underneath coverage on the post route. 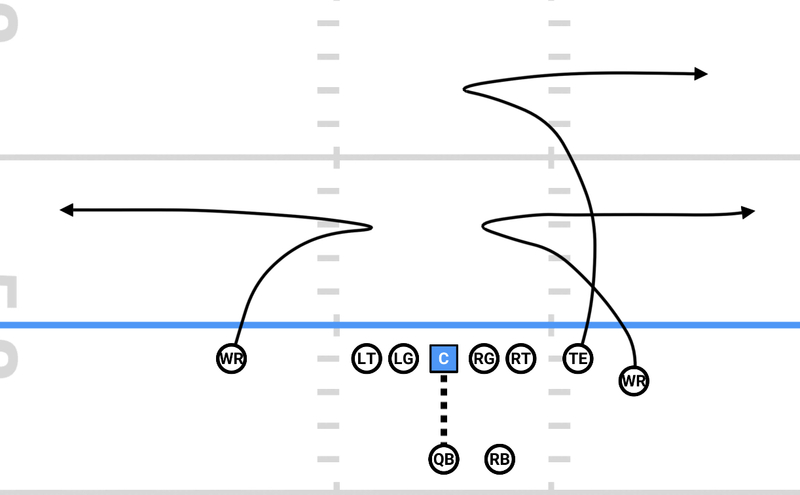 If the dig is pushed upfield enough, it could also draw a safety, helping to open things up for the post. In this case, the dig route is picked up by the defender in that zone. Since that defender didn’t bail, Adams is man-to-man on the post. All he has to do is beat him to the inside. Of course, Adams does that easily. Because he’s Davante Adams. Rodgers has to step up to avoid the rush, but he finds a bit of green space. Since he had a view of the coverage before the snap and was able to see what was happening immediately after the snap, he knows he has Adams. He just needs to wait a beat for the route to develop and find enough space to get the pass off. That’ll do it for the week. As always, I’ll be posting more passing breakdown gifs over on Twitter. So hit me up over there if you need more plays, but not quite the same amount of depth.